Update February 2015: Old Town Tavern closed the last weekend of January. Here's a comment from the eatery on its Facebook page "we lost our lease and moving to moorpark with a new concept called Kraftap stay tuned!" Update 5/4/14: Old Town Tavern Camarillo is now open for business. 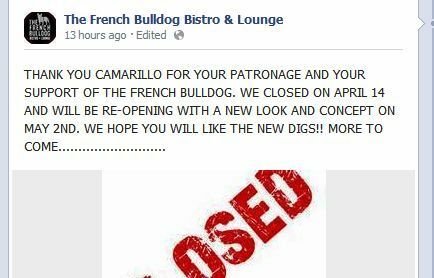 Today (4/17/14), The French Bulldog Bistro & Lounge announced on its Facebook page that it closed its doors this past Monday, April 14th, but will "be re-opening with a new look and concept on May 2nd." No other details at this point but the indicate the new concept will appeal to a wider audience. 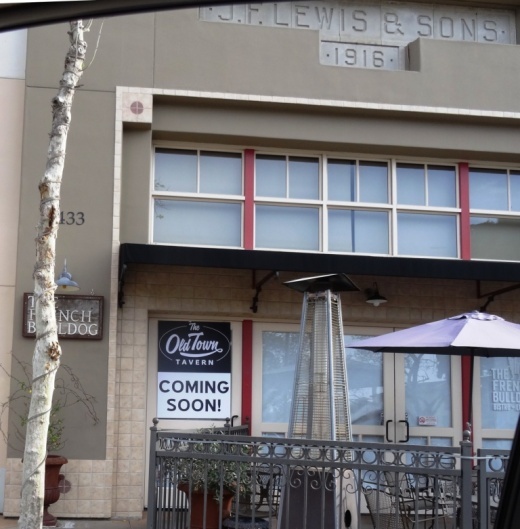 The former The French Bulldog is located at 2433 Ventura Boulevard in Old Town Camarillo. It originally opened in March 2012. Prior to that, JJ Brewsky's was at this historic location. On a historic note, this building was established in 1916 by Joseph F. Lewis & Sons, making it nearly 100 years old! The building originally housed a department store, confectionery store, barber shop, the Farmers Bank of Camarillo and the Knob Hill Garage.